"Indian traditions reach and multifaceted. Indian culture goes thousands of years back in time. Most of us know about yoga but may be not all of us know about classical ancient Temple Dance - Bharatha Natyam of Tamil Nadu. This dance is older than 2000 years. Word "Bharatha" means world. According to the story "all devas including Indra asked Brahma deva to produce an art which includes all the Navarasas (the nine rasas - essence or essential mental state). Lord Brahma then took words from Rig Veda, Music from Sama Veda, Abhinaya from Yajur Veda and Navarasa from Adarvana veda and created Bharatha natyam. His first student was Bharatha Muni who formulated the "Natya Sasthra" as the fifth veda and taught his art to his hundred sons." This classical dance is a beautiful yoga by itself. It is moving architecture of a human form. The postures are Sacred Geometry by itself. Who practices this dance regularly, they say that the dancer feels the inner energies raising and flowing through the body. This dance is not only beautiful but also a healing dance. The postures of the dancer are based on the sacred geometry of a rhombus (squire turned under 45 degrees) and a circle. The mudras of the hands, the positions of the feet are linking and pressing energy points of the body to steer up the inner life force of the dancer and to bring her or him closer to the enlightenment. Even watching professional dances of Bharatha Natyam is a healing process by itself. The seer may feel the energy enveloping the entire space around the dancer and penetrating the spectator too. I personally experienced that. It was a very powerful feeling. I always liked to dance and decided to start studying an "Indian dance". Little did I know that there are many styles of Indian dance and the most difficult one is Bharatha Natyam! I am taking it for three years and it is just a hobby. I had no idea how difficult this dance is. But it is very rewarding to study it. 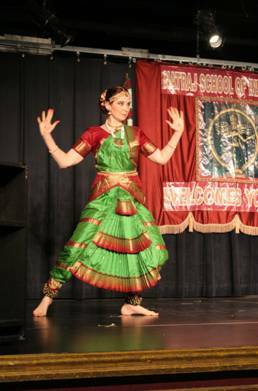 My Bharatha Natyam dance teacher is Daya Ravi at Nataraj School of Indian Dance, Boyds, Maryland. She is a professional performer and a teacher of many years. Daya is from Chennai, Tamil Nadu and happened to know my Vaastu Guru Dr. Ganapati Sthapati too. I could not dream of a better Bharatha Natyam dance teacher. Her daughter Sneha is an incredible dancer and anyone should see her performance. More about Nataraj School of Indian Dance is here. Left Photo: Bharata Natyam Dance Teacher -Daya Ravi at Nataraj School of Indian Dance. 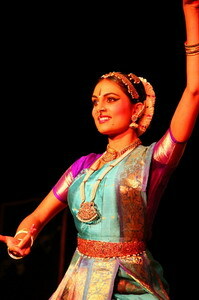 Right and center Photo: Sneha performing Bharatha Natyam dance. I am performing Bharatha Natyam.